Cocaine cartels are all about succession: The day Pablo Escobar went down, the Cali Cartel became public enemy number one. They called themselves the Gentlemen of Cali, the biggest drug lords you've probably never heard of. Led by four powerful godfathers, the Cali Cartel turned the cocaine trade into a global enterprise. You can catch a glimpse at the main players of this new cartel in the Narcos Season 3 trailer, and if you're in New York City today, you can pick up a special treat from this hit series. Netflix unveiled the trailer for Narcos Season 3 today in New York City, where this season was partially filmed. The trailer will be shown at various locations around Manhattan today via a Narcos truck, which will also be serving white powdered donuts and Colombian coffee to passersby throughout the day. Seeking a sugar high, follow @NarcosNetflix for the latest truck location. For those who aren't in the Big Apple, the trailer debuted on Netflix YouTube, which opens up with a thrilling barbershop gunfight scene, featuring a surprising appearance from comedian Gabriel Iglesias as one of the hitmen. This new season picks up just as Gilberto announces a bold plan to walk away from the business, DEA agent Javier Pena (Pedro Pascal) enlists the help of American and Colombian law enforcement to take it down. This season opens up a complex and ruthless world of new figures. Other new characters making their debut this season are Jorge Salcedo (Matias Varela), Cali's head of security who prioritizes his wife and kids' protection over his bosses, DEA agents Chris Feistl (Michael Stahl-David) and Daniel Van Ness (Matt Whelan), who enter the operation with enthusiasm and inexperience, Franklin Jurado (Miguel Angel Silvestre), the cartel's money launderer who unknowingly puts his wife, Christina (Kerry Bishe) in mortal danger and David Rodriguez (Arturo Castro), Miguel's oldest son, who is reluctant at first to take a leading role in the cartel structure. 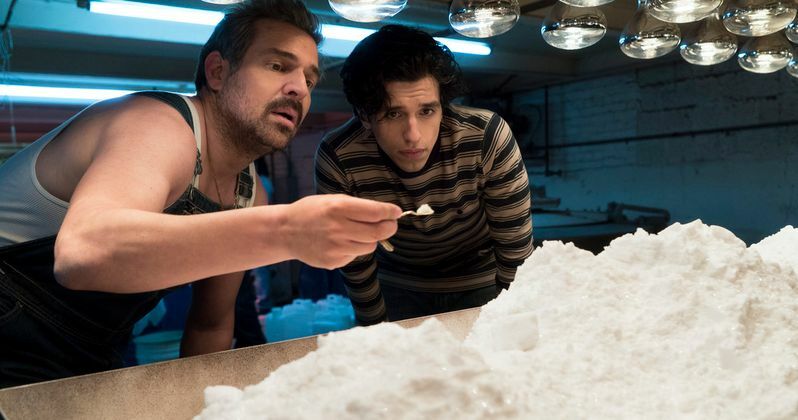 Netflix renewed Narcos for both Season 3 and Season 4, so fans can expect at least another season, and likely more, if Season 3 is just as big a hit as the first two seasons. Along with this new trailer, we also have photos from the first stop on the Narcos coffee truck's tour throughout New York City, which began at 8 AM at East 42nd Street, between Park & Madison, across from Grand Central Station), with Season 3 breakout star Arturo Castro even stopping by. The truck will then be traveling to 48th Street & Sixth Avenue, 57th Street & 8th Avenue, Albany Street between S. End Avenue and West Street and Union Square West between 16th and 17th Streets. Fans can follow the @NarcosNetflix Twitter account today to see when the truck will be on the move. Take a look at the new Narcos Season 3 trailer, and photos from the Narcos coffee truck below, along with a new Season 3 image.